New: Consultation regarding vocational training. Development of curricula and text books. Procurement of experts and teachers. Dr. Kürsten used to author the press releases of the Deutsche Messe AG concerning the LIGNA fair. Press reports are a an essential element of marketing. Their effectiveness depends on their up-to-dateness and their notation, which has to be well adapted to the specific audience. Wood Report authors reports about companies, special events, and the successful application of wood working machinery at the customers plant. This is much cheaper and more efficient than big advertisements! Publications (or translations) in German language! One of our customers since many years: Foundation "Forest in Need"
Practically each organisation and company nowadays has its website. But can it be found by potential customers and does it really provide interesting information for them? Try to find your products with a search engine! The success depends on the arrangement and linkage of the website and on the activity there by visits due to interesting and actual information. Wood Report supplements the work of your advertising agency by adding technical information, games and other interesting stuff to attract visitors. 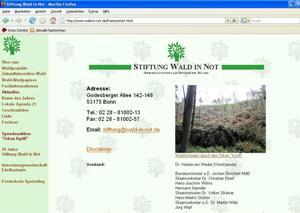 Wood Report especially cares for a German version of your website which really might be helpful to attract German customers! Organisation of conferences, excursions, summer schools etc. Conferences and excursions are not only a quite vivid form of knowledge transfer but alse a way of get together and making contacts. Wood Report organises such events and cares for really satisfied participants. The service may also include the search for funding and for partners (companies, universities). Congresses and conferences all over the world are possibilities to collect information on the latest developments. The optimal form of documentation of such events was the original idea of Wood Report (formerly Congress-Report). A CD-ROM provides much more possibilities than simply to list the Power-Point presentations or the papers. Ask for a sample-CD! In addition to this documentation service Dr. Kürsten can go to conferences exclusively for you, either to give a presentation or to collect information if your staff has no time to participate. Are you interested? Don´t hesitate to contact Wood Report, explain your needs and ask for an offer!